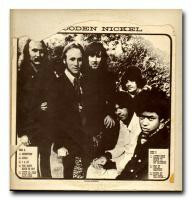 Plain white cardboard sleeve with a picture of the band inserted between cardboard and outer plastic sleeve. Tracklist for Side A and Side B in bottom left and bottom right corners. Labels are plain white with light blue writing: "Canyon Records" on top along with a track list. Recorded live at the Big Sur Music Festival, Big Sur, California (USA) September 13-14, 1969. On Side A: David Crosby-Lead & Backing Vocals, Acoustic Guitar [uncredited]; Stephen Stills-Lead & Backing Vocals, Acoustic Guitar [uncredited]; Graham Nash-Lead & Backing Vocals [uncredited]; Neil Young-Lead Vocals, Acoustic Guitar [uncredited]. On Side B: David Crosby-Electric Rhythm Guitar, Backing Vocals [uncredited]; Stephen Stills-Lead & Backing Vocals, Lead Electric Guitar [uncredited]; Graham Nash-Backing Vocals, Keyboards [uncredited]; Neil Young-Lead Vocals, Keyboards, Lead Electric Guitar [uncredited]; Greg Reeves-Electric Bass [uncredited]; Dallas Taylor-Drums [uncredited].